A high percentage of the work that we do at A2L Consulting is on cases with billions at stake. Over the last 18 years, we've seen trial teams prepare well and we've seen trial teams caught underprepared, often because they believed that settlement was imminent and that there was little or no need for trial preparation. 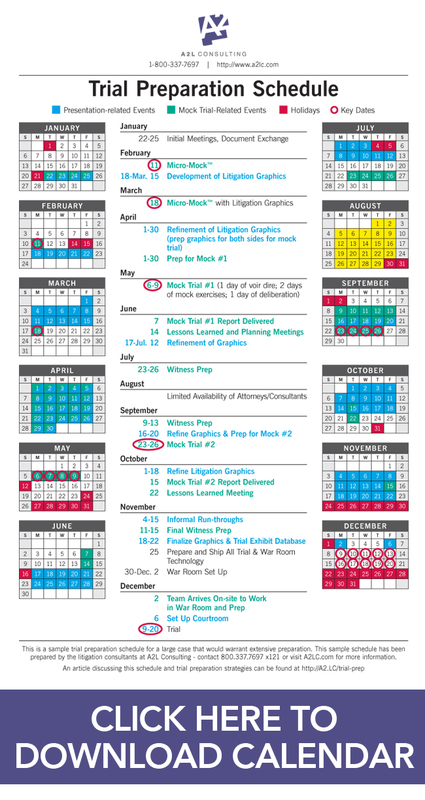 So that no one gets caught without being prepared, here’s a sample calendar that lays out a trial preparation plan for mock trials, the creation of litigation graphics, the planning and deployment of trial technology, witness preparation and informal run-throughs on the eve of trial. Not every case warrants this level of preparation. However if your client is in a bet-the-company situation, if there is $20 million or more at stake or if there is a threat of pattern litigation, then this level of preparation is entirely appropriate - if not required. Gone are the days when a trial lawyer wings his or her way through a trial and tries to use charm to win a case. Juries and judges expect a lot more these days from attorneys than they did 10 years ago. They want to see a well-rehearsed show with evidence nicely teed up for decision-making, witnesses who are well prepared, and a lawyer who has planned everything out, including the technology. Anything less, and they'll likely punish your client for it on some level. The best litigators that I see prepare a lot with the support of a client. Often this involves several rounds of full-scale mock trials. However, the most important thing a client can do is create an environment where the trial attorney feels that he or she can make mistakes. As they say in show biz, bad rehearsal, great performance. 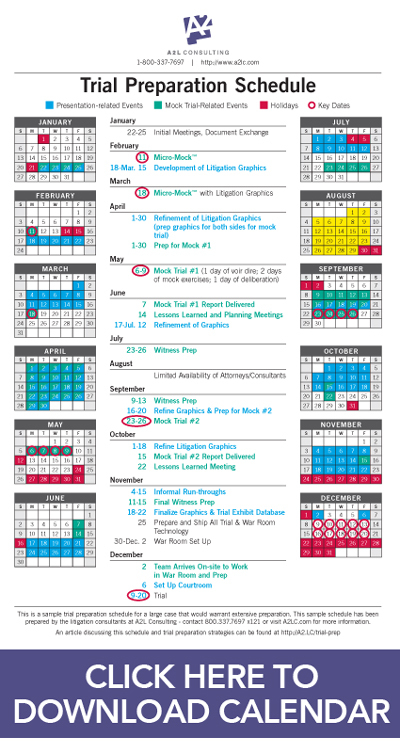 In the sample calendar below, we show a year's worth of preparation for a hypothetical 2-week December trial. We use our Micro-Mock™ service for an early case assessment and to help clarify the likely trial themes and story. Preparation of litigation graphics starts early to allow for several rounds of testing, refinement and approval over the course of the year. Two mock-trial exercises are planned with three or four panels of jurors per exercise. Witnesses are thoroughly prepped and trial technology for both the war room and the courtroom are planned and set up. Finally, a series of run-throughs are scheduled just prior to trial to make sure that trial counsel, the trial technician, witnesses and the trial technology are operating like a well-oiled machine. What we are describing below is a general sense of how this should work, using a sample calendar. There is considerable variability in the investment required, both in terms of time and money, depending on how many witnesses there will be, how long a mock trial, how many graphics there are, how long the trial is, and other variables. Why Do Movie Lawyers Look So Polished? Practice! Why Should I Conduct a Mock Trial? What is a Micro-Mock™ Trial and How Does it Help Me Prepare for Court?